Tony Greenstein's second polemic on "Perdition"
Sean Matgamna's second reply on "Perdition"
Big screen blues: What's wrong with movies? I would be the last person to complain that the reply to my letter in Workers' Liberty 7 was more than four times the length of the original. As always, Tony Greenstein doesn't debate the issue in dispute. He worries around the edges of it, quibbling over secondary details and evading the questions he is supposed to be dealing with. 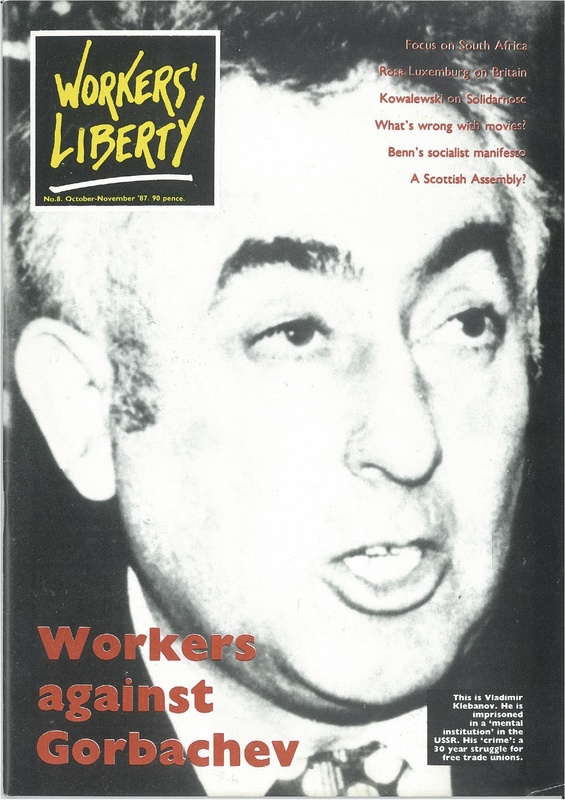 A collection of articles and responses from Workers' Liberty 8, October 1987. Including Scottish devolution, the question of banning the Orange Order and a letter on Zionism and Israel by Tony Greenstein with a response from John O'Mahony. Zbigniew Kowalewski, a former leader of the left-wing in Solidarnosc, describes how Solidarnosc fought for workers' control in Lodz in 1980-1. This is an abridged translation of a chapter from his book, 'Rendez-nous nos usines'. A South African socialist active in the trade unions talked to Workers' Liberty about the obstacles in the way of building a workers' party to give direction to the struggle for liberation during Apartied.